Waking up from a Hinds hangover is like no other, and there is no other like Hinds. This Spanish rock band know how to party, know how to make music, and definitely know how to make sure everyone around them is having the time of their lives. The day before Hinds very own festival – Party Planet – is due to take place, I hop onto FaceTime with Ana and Amber. And as Carlotta peeps her head round the camera and waves at me frantically, I feel like I’m FaceTiming some of my mates who just moved in together. Because that is what Hinds is, they’re mates. And they make everyone around them their mate. That could be because as soon as Ana and Amber answer they are calling me out for not being there in person. 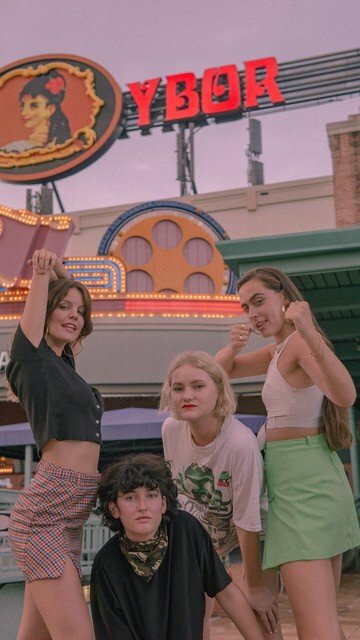 But instead of getting a tour of their new pad through the phone, we are talking about Hinds’ latest album, UK drinking habits, and how this band from Madrid created rock’n’roll. The band have just travelled from Leeds to London after playing in a church, which was “super loud” according to Amber. But the following day hits new decibels. Party Planet truly took you out of this world, held at EartH in Dalston, Hinds had arranged a full line up of bands, one-off merch and even served up Spanish tapas. Ana explains, “The more we write the more we realise there are less and less songs where women are the active person, instead of being passive. Whenever you’re singing lyrics, all the girls relate to it by being the one they’re talking about rather than being the ones that are actually talking. We realised that and we purposefully put the word ‘him’, saying the boy as the passive in all these lyrics. We wanted to make it all the clearer with ‘British mind’.” And clearly they did – in the opening of ‘British Mind’, Carlotta sings, ‘I am not the girl they sing a song about / I’m the one who writes the story now / Follow me this is my town / I’ve been here for two hours now.’ The lyrics perfectly epitomises the whirlwind that forms Hinds. Amber says, “You stop having your own life basically. It’s never easy I guess. Touring is really hard, but we have the best-case scenario. Good vibes.” As she grins and peace sign’s the camera. Ana continues by explaining how Hinds is a personal band, “I don’t think anyone that is a fan of Hinds doesn’t know who personally Hinds are. We’re that kind of band where the personality is very strong in the records, in the recordings, in the live shows, social media, everywhere. I think you really can tell we’re Spanish in everything we do. Which we’re proud of, but Madrid is a place that first of all is kind of poor so that makes us be in the streets a lot of the time and also the fact its hot means we’re constantly together in the streets. It’s not like in the northern countries when people are sitting on their computers because they don’t wanna go out because it’s so cold. Spain is totally the opposite. We like sharing and talking all the time, constantly talking in the streets together. I think you can tell that not only are we from Spain, but we are from Madrid. Whenever we are [in the UK] and the bar closes at 2am, we are like ‘what?’ We don’t understand. We simply do not understand. But you guys start drinking earlier, that’s something we saw. It’s not because you drink less or we drink more, it’s because you drink at 4pm and at 4pm we’re having the coffee after lunch.” Mid-afternoon espressos might mean you don’t end up peaking after too many Estrellas before 10pm.